Rama’s confrontation with the enemies is followed by four panels at Pullamangai – all of which are located in the Vedipada of the Mukha Mandapa. This niche features the famous Durga, considered to be yet another masterpiece of the early Chola period. In recent times, this niche has been converted into a sub shrine with concrete walls, thereby disturbing the overall appeal of the entire Bhadra segment. 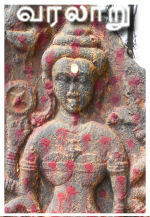 Constant anointment with oil has also taken its toll on the Durga sculpture as well as Vedipada Ramayana panels. The four Ramayana panels have to be studied under all these constraints. 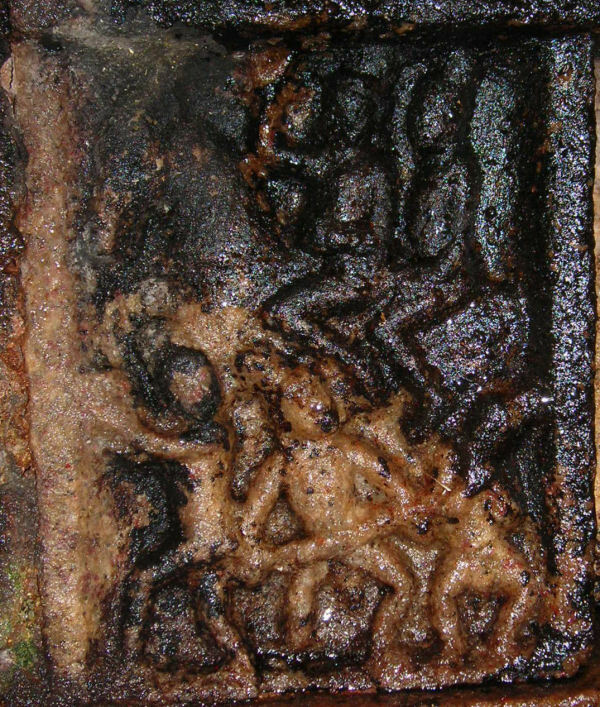 The Vedipada on the extreme left [Panel No.24] is left un-sculpted. The second Pada [Panel No.25] located very near Durga has suffered serious damage due to oil application and nothing much can be derived from what is remaining. Thus, conclusions have to be drawn based on the other two panels located to the right of Durga sculpture. 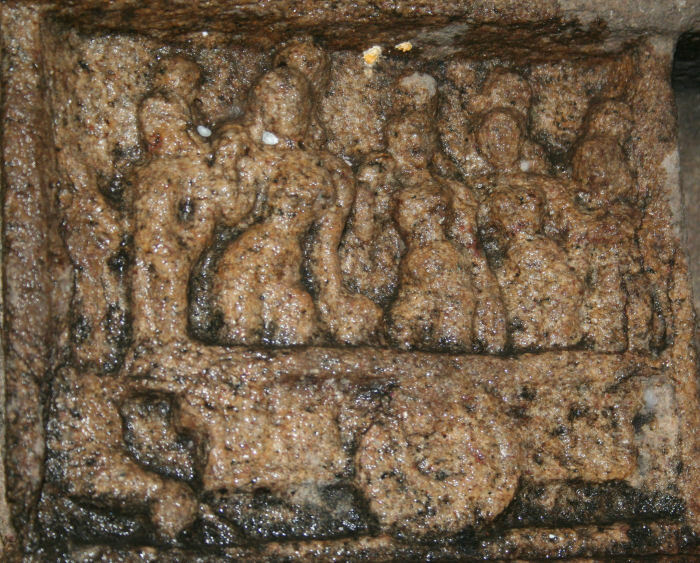 Panel Segment: Vedipada in the Bhadra segment, facing North. The panel is damaged beyond recognition at present. Cleaning might potentially uncover some of the details. Placement: Significant. Visible right below the Durga Devakoshta, facing the spectator. Theme: A royal procession constituting an artist band accompanying a large horse with riders. There are six characters in this panel, out of which five are humans and one is an animal (Horse). Interestingly, the animal is the most dominant character in this panel. The theme portrayed is peculiar to Pullamangai and is not repeated in any other early Chola Ramayana narratives. The panel portrays a royal procession featuring a band of artisans on the foreground and two soldiers riding on a large horse in the background. The artisan band includes two musicians and one dancer. Both musicians are playing percussion instruments. The first one adorned in Jatamakuta headdress. Playing a large cymbal (Ilai Thalam), he is walking. His head is turned towards the dancer, suggesting coordination. The second one, also wearing Jatamakuta - is playing a lengthy drum (Mathalam). The exact name of this instrument (as known during Chola times) cannot be determined at present. His head is also oriented towards the dancer. The coordination between the musicians and the dancer is a significant feature of the artist band. The dancer, portrayed at the extreme left of the panel, is shown in Mandala posture. Wearing Jatamakuta, he seems to be a bearded man – bending his head and dancing to the rhythm. Taken together, the trio represent a music and dance troupe performing alongside the procession. The horse, though sculpted in the background, occupies the entire width of the panel. Its size is significant, compared to other characters. The reason for this dominance and the significance of horse in the sculpted theme is unclear at present. Two males (potentially soldiers) wearing Jatamakuta are riding the horse. The first one is holding something in his right hand. This object is unidentifiable because of the black crude deposit. The second male is accompanying the first. The entire theme is a part of a royal procession. Placement: Significant. Visible at the extreme right end of the Bhadra, facing the spectator. Theme: Royal ladies travelling in a horse drawn chariot. There are six characters in this panel, out of which five are humans and one is an animal (Horse). Out of five humans, one is a male and the rest are females. Unlike the earlier panel, the horse portrayed in this panel is very small in size compared to other characters, making it insignificant. It is simply a part of the chariot. The theme represents a group of the royal ladies travelling in a horse drawn chariot. Connecting this with the earlier panel, one can see that they form an integral part of the same scene. The horse, its riders and the musicians are accompanying this royal convoy. The first male figure shown in the front is the charioteer. He is standing in Kodinji – a wooden projection in front of the chariot. Four royal ladies are standing inside the chariot and travelling. Out of the four, the first one is the most significant. Her right hand is held near her ears, while the left is hanging. The several bends in her body suggest her tender physique. The second lady, who is slightly less significant than the first, is also shown in similar posture. The third and fourth ladies are accomplices to the first two. This significance of this overall scene and the earlier procession is not well understood at present. It might potentially represent Seetha and her sister Urmila coming to Ayodhya after the marriage and the royal welcome provided to them.